Jordan Point Lighthouse – Chesapeake Chapter U.S.L.H.S. Jordan Point Lighthouse was built in 1855 in the upper James River near Hopewell, Virginia, twenty miles from Richmond. Jordan Point was one of four early navigational aids on the James River leading to Richmond. 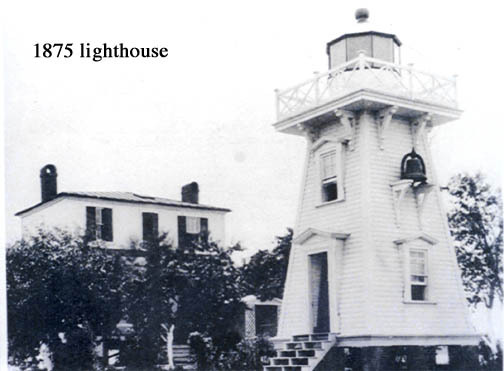 The first lighthouse was a white, twenty-four foot by 17-foot rectangular two-story structure supported on stone piers with the lantern protruding through the middle of the red roof. The first floor had two rooms, each with a fireplace and stairwell in the middle of the house which extended up through the second floor to a trap door to the lantern room. The second floor had two bedrooms, one with a fireplace, and a storage room. The lens was a pressed-glass masthead, a sixth-order lens which exhibited a fixed white light, 35-feet above mean high water. The light was first exhibited on February 7, 1855. There was also a hand operated fog bell located between the house and the beach. During the Civil War, the lighthouse was damaged as it was constantly under fire by Confederates. After the war in 1865, the light was repaired & placed back into service. By 1875, erosion started to take a toll on the shoreline threatening the lighthouse. Funds were approved to protect the station by adding a six-foot-thick stone wall supported by soil backfill. In 1887, bids were accepted for removing the old lighthouse and constructing a new lighthouse. A new keeper’s dwelling and square, pyramidal wooden fog bell is completed in January 1888 at a price of $3,449 dollars. The lantern was placed on top of the fog bell tower, becoming the second lighthouse. This new lamp and fog bell tower were covered in clapboard siding and had more detailed woodwork than the keeper’s dwelling. On February 27, 1914, Jordan Point Front Range Light was established. This light was a fixed, red oil light on a three-pile structure and was located 1,300 yards from the existing wooden bell tower that would later become Jordan Point Rear Range Light. The house and surrounding property except for a small plot where the tower stood were sold in 1927 at a price of $1,105 dollars. The building and property were abandoned in the 1930s. Keepers: Theodoric Bland (1855 – 1859), George W. Harrison (1859 – ), Charles W. Topping (1865 – 1867), William A. Wood (1867), W. Thompson (1867 – 1868), William H. Baldwin (1868 – 1878), D. Batts (1878 – 1879), B.F. Topping (1879 – 1880), Edward D. Bland (1880 – 1881), W.H. Moody (1881 – 1882), Edward D. Bland (1882 – 1883), William H. Moody (1883 – 1884), Edward D. Bland (1884 – 1885), William Dabney (1885 – 1887), John H. Knowles, Jr. (1887), Thomas E. Fenner (1887 – at least 1925).